World renown artist, Robert Bailey, trained at Longton College of Art in England during the 60s. He only just squeaked through with an E for effort rating at the bottom of a class of 36 students. There followed various careers in photography, journalism and television. The latter was shooting television commercials on film and hosting a childrens television show. He then entered the field of aviation art, and became known worldwide in the genre for creating oil paintings of military action and having the veterans sign lithographs made from them. 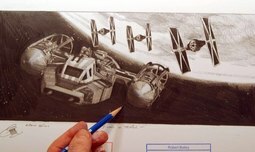 Movie producer George Lucas came across Roberts aviation art website and asked him to work on Star Wars. 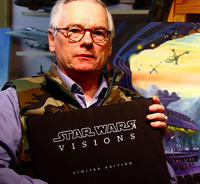 After meeting with George at Skywalker Ranch, Roberts career took on a new twistStar Wars and other movies. Lucas was sufficiently impressed by Roberts work to purchase originals for his private collection. Robert has gone on to create similar work for sale at comic conventions. His favorite characters are C3PO and Yoda, although he recreates the full spectrum of Star Wars characters in pencil. He is now retired from oil painting but finds that pencil is more fluid and scenes can be created far faster this way. The number of fans at Comicons who purchase Roberts original movie creations has increased in leaps and bounds over the past four years, and he loves to meet all of the fans who attend.